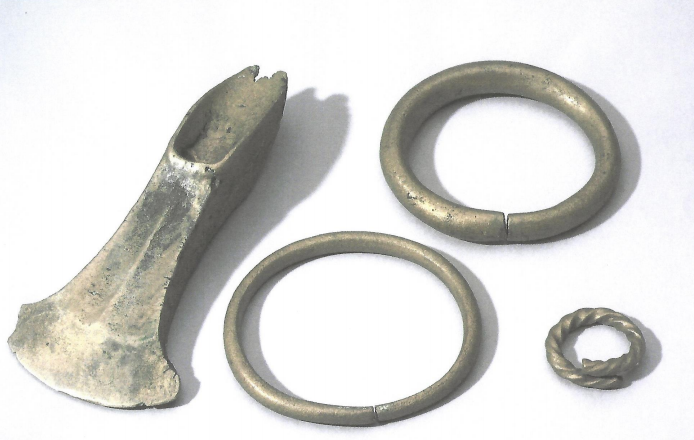 This is the period - from about 2300 to 700 BC - when metal first began to be widely used in Britain, possibly as a result of the increase in contact with Europe. However, various types of stone, particularly flint, remained very important for long after metal became available. Bronze Age society seems to have been divided into tribal areas based around an agricultural economy and it is during this period that over exploitation of the light soils in our area led to the formation of the heathlands we see today. The countryside around Whitehill and Bordon also has an unusually high concentration of Bronze Age barrows (high status burial mounds) that form a sacred landscape. This may be linked to nationally important ritual deposits of bronze weapons and ornaments found at Whitehill and Woolmer shown above. There is no clear consensus on the date for the beginning of the Bronze Age in Great Britain and Ireland. Some sources give a date as late as 2000 BC, while others set 2200 BC as the demarcation between the Neolithic and the Bronze Age. The period from 2500 BC to 2000 BC has been called the "Late Neolithic/Early Bronze Age", in recognition of the difficulty of exactly defining this boundary. 2500-2000 BC: Mount Pleasant Phase, Early Beaker culture: ; Britain: copper + tin. 2100-1900 BC: Late Beaker: knives, tanged spearheads (Bush Barrow; Overton Period). 1900-1500 BC: Bedd Branwen Period; copper + tin. 1500-1300 BC: Acton Park Phase: palstaves, socketed spearheads; copper + tin, also lead. 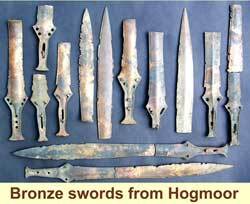 1300-1200 BC: Knighton Heath Period; "rapiers." 1200-1000 BC: Early Urnfield; Wilburton-Wallington Phase. 1000-900 BC: Late Urnfield: socketed axes, palstaves (also lead). 800-700 BC: Ewart Park Phase, Llyn Fawr Phase: leaf-shaped swords. In around 2700 BC a new pottery style arrived in Great Britain, often referred to as the Beaker culture. Beaker pottery appears in the Mount Pleasant Phase (2700 - 2000 BC), along with flat axes and burial practices of inhumation. People of this period were also largely responsible for building many famous prehistoric sites, such as the later phases of Stonehenge along with Seahenge. Movement of Europeans brought new people to the islands from the continent. Recent tooth enamel isotope research on bodies found in early Bronze Age graves around Stonehenge indicates that at least some of the new arrivals came from the area of modern Switzerland. The Beaker culture displayed different behaviours from the earlier Neolithic people and cultural change was significant. 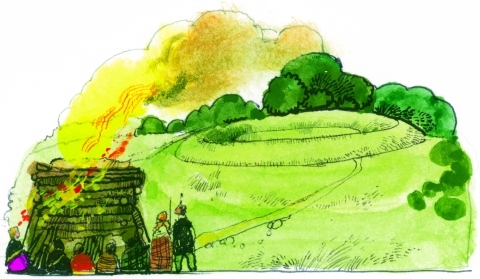 Integration is thought to have been peaceful, as many of the early henge sites were seemingly adopted by the newcomers. Also, the burial of dead (which until this period had usually been communal) became more individual. For example, whereas in the Neolithic a large chambered cairn or long barrow was used to house the dead, the 'Early Bronze Age' saw people buried in individual barrows (also commonly known and marked on modern British Ordnance Survey maps as tumuli) or sometimes in cists covered with cairns. They were often buried with a beaker alongside the body. There is some debate amongst archaeologists as to whether the 'Beaker people' were a race of people who migrated to Great Britain and Ireland en masse from the continent, or whether a prestigious Beaker cultural "package" of goods and behaviours (which eventually spread across most of western Europe) diffused to the islands' existing inhabitants through trade across tribal boundaries. Modern thinking tends towards the latter view. Alternatively, a Beaker elite may have made the migration and come to influence the native population at some level. Believed to be of Iberian origin (modern day Spain and Portugal), part of the Beaker culture brought to Great Britain the skill of refining metal. At first they made items from copper, but from around 2150 BC smiths had discovered how to make bronze (which is much harder than copper) by mixing copper with a small amount of tin. With this discovery, the Bronze Age began in Great Britain. Over the next thousand years, bronze gradually replaced stone as the main material for tool and weapon making. The bronze axehead, made by casting, was at first similar to its stone predecessors but then developed a socket for the wooden handle to fit into, and a small loop or ring to make lashing the two together easier. Groups of unused axes are often found together, suggesting ritual deposits to some, though many archaeologists believe that elite groups collected bronze items, perhaps restricting their use among the wider population. Bronze swords of a graceful "leaf" shape, swelling gently from the handle before coming to a tip, have been found in considerable numbers, along with spear heads and arrow points. Great Britain had large reserves of tin in the areas of Cornwall and Devon in what is now Southwest England, and thus tin mining began. By around 1600 BC, the southwest of the island was experiencing a trade boom as British tin was exported across Europe. Bronze-age Britons were also skilled at making jewellery from gold, as well as occasional objects like the Rillaton Cup and Mold Cape. Many examples of these have been found in graves of the wealthy Wessex culture of Southern Britain, though they are not as frequent as Irish finds. 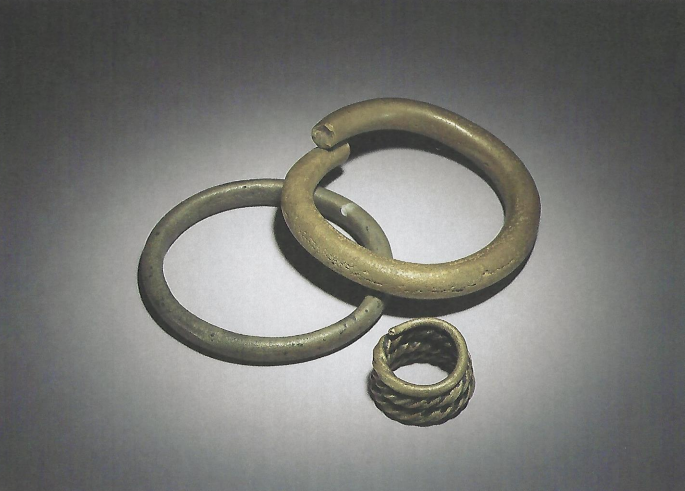 The greatest quantities of bronze objects found in what is now England were discovered in East Cambridgeshire, where the most important finds were recovered in Isleham (more than 6500 pieces). The earliest known metalworking building was found at Sigwells, Somerset, England. Several casting mould fragments were fitted to a Wilburton type sword held in Somerset County Museum. They were found in association with cereal grain dated to the 12th century BC by carbon dating. The rich Wessex culture developed in southern Great Britain at this time. The weather, previously warm and dry, became much wetter as the Bronze Age continued, forcing the population away from easily defended sites in the hills and into the fertile valleys. Large livestock farms developed in the lowlands which appear to have contributed to economic growth and inspired increasing forest clearances. There is evidence of a relatively large-scale disruption of cultural patterns which some scholars think may indicate an invasion (or at least a migration) into Southern Great Britain around the 12th century BC. This disruption was felt far beyond Britain, even beyond Europe, as most of the great Near Eastern empires collapsed (or experienced severe difficulties) and the Sea Peoples harried the entire Mediterranean basin around this time. Cremation was adopted as a burial practice, with cemeteries of urns containing cremated individuals appearing in the archaeological record. According to John T. Koch and others, the Celtic languages developed during this Late Bronze Age period in an intensely trading-networked culture called the Atlantic Bronze Age that included Britain, Ireland, France, Spain and Portugal, but this stands in contrast to the more generally accepted view that Celtic origins lie with the Hallstatt culture. Bowl Barrows are the most numerous form of round barrow, are funerary monuments dating from the Late Neolithic period to the Late Bronze Age, with most examples belonging to the period 2400-1500 BC. They were constructed as earthen or rubble mounds, sometimes ditched, which covered single or multiple burials. They occur either in isolation or grouped as cemeteries and often acted as a focus for burials in later periods. Often superficially similar, although differing widely in size, they exhibit regional variations in form and a diversity of burial practices. There are over 10,000 surviving bowl barrows recorded nationally (many more have already been destroyed), occurring across most of lowland Britain. Often occupying prominent locations, they are a major historic element in the modern landscape and their considerable variation of form and longevity as a monument type provide important information on the diversity of beliefs and social organisations amongst early prehistoric communities. They are particularly representative of their period and a substantial proportion of surviving examples are considered worthy of protection. The most fragile type of round barrow, date mostly to the period 1400-1200BC, the Early Bronze Age. They are rare nationally with about 250 known examples, most of which are in Wessex. Date to the Early Bronze Age, most examples falling between 1800 and 1200BC. They are one of rarest forms of round barrow with about 60 examples known nationally, most of which are in Wessex. The most visually impressive form of round barrow, are funerary monuments dating to the Early and Middle Bronze Age, with most examples belonging to the period 1500-1100 BC. They occur either in isolation or in round barrow cemeteries and were constructed as single or multiple mounds covering burials, often in pits, and surrounded by an enclosure ditch. The burials are frequently accompanied by weapons, personal ornaments and pottery and appear to be those of aristocratic individuals, usually men. Bell barrows (particularly multiple barrows) are rare nationally, with less than 250 known examples, most of which are in Wessex. Their richness in terms of grave goods provides evidence for chronological and cultural links amongst early prehistoric communities over most of southern and eastern England as well as providing an insight into their beliefs and social organisation. As a particularly rare form of round barrow, all identified bell barrows would normally be considered to be of national importance. Date to the Bronze Age (c.2000-700 BC). They comprise closely-spaced groups of up to 30 round barrows - rubble or earthen mounds covering single or multiple burials. Most cemeteries developed over a considerable period of time, often many centuries, and in some cases acted as a focus for burials as late as the early medieval period. They exhibit considerable diversity of burial rite, plan and form, frequently including several different types of round barrow, occasionally associated with earlier long barrows. Where large scale investigation has been undertaken around them, contemporary or later "flat" burials between the barrow mounds have often been revealed. 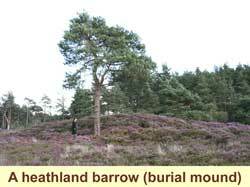 Round barrow cemeteries occur across most of lowland Britain, with a marked concentration in Wessex. In some cases, they are clustered around other important contemporary monuments such as henges. Often occupying prominent locations, they are a major historic element in the modern landscape, whilst their diversity and their longevity as a monument type provide important information on the variety of beliefs and social organisation amongst early prehistoric communities.